Applies a specific template from a specified file to the chart. The command is added to chart message queue and executed only after all previous commands have been processed. [in] The name of the file containing the template. The Expert Advisor will be unloaded and will not be able to continue operating in case of successful loading of a new template to the chart it is attached to. 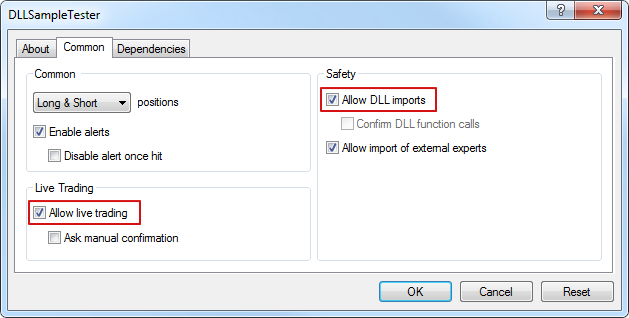 Live trading and DLL imports permissions cannot be extended for the Expert Advisors launched by applying the template using ChartApplyTemplate() function. If the mql4 program calling ChartApplyTemplate() function has no permission to trade, the Expert Advisor launched via the template will also not be able to trade regardless of the template settings. If the mql4 program calling ChartApplyTemplate() function has permission to trade, while there is no such permission in the template settings, the Expert Advisor launched via the template will not be able to trade. Color of the stop order levels (Stop Loss and Take Profit). Besides, there can be multiple graphical objects and indicators on a chart. You may set up a chart with all the necessary indicators once and then save it as a template. Such a template can be applied to any chart. if a template is not found in the first two variants, the search is performed in the folder terminal_directory\Profiles\Templates\. Here terminal_directory is the folder from which the MetaTrader 4 Client Terminal is running, and terminal_data_directory is the folder, in which editable files are stored, its location depends on the operating system, user name and computer's security settings. Normally they are different folders, but in some cases they may coincide. The location of folders terminal_data_directory and terminal_directory can be obtained using the TerminalInfoString() function. Templates are not resources, they cannot be included into an executable EX4 file. Print("File 'my_template.tpl' not found in "